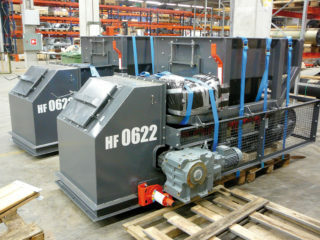 HF100 Belt Feeder is standardized for feeding applications. It is usually arranged under silos, stockpiles or similar to feed belt conveyors, crushers, screens and other process machines. Typical feed materials include different types of ores, coal, limestone and similar raw materials. Vibration free operation, accurate and steady material flow is ideal for bulk materials with fine grain size. With over 1000 standard and tailor-made belt feeder units delivered, the gained expertise is used to fulfill the application demands. 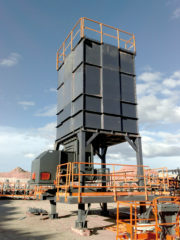 Adjustable material height gate can be used for capacity adjustment. More accurate and wider capacity range can be achieved with an optional frequency converter. 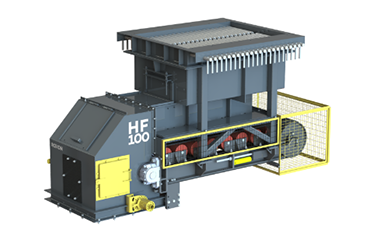 HF100 Belt Feeder is supplied with high quality mesh guards protecting against hazards and still enabling visibility for maintenance. Pull cord emergency stop system or push buttons, belt misalignment switches and rotation detector sensor are also provided as standard. 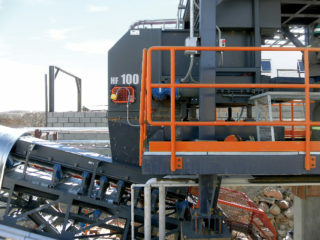 Non-closed machine structure ensures easier maintenance access and visibility. Rollers are lubricated for life and centralized lubrication for drive and tail shaft bearings is available as an option. Standard components are used for easier spare part access.